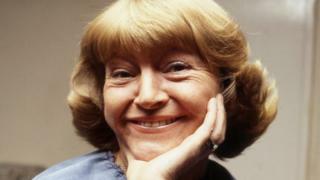 Dora Bryan, the veteran British actress whose long career encompassed theatre, film, radio and television, has died in Hove, near Brighton, at the age of 91. She was best known for her roles in Last of the Summer Wine and Absolutely Fabulous, and won a best actress Bafta for the 1962 film A Taste Of Honey. Her grandson Sam said her "longevity as an actress had been truly incredible". She died at the Sussex County Hospital in Brighton, with her sons Daniel and William at her bedside. Daniel told the Argus newspaper: "It was heartbreaking but it was peaceful. "She just left us. "She was a tiny woman but her constitution was incredible. She loved being on stage, that's what she wanted. Not only did she do it, but she was good at it. Born Dora May Broadbent in Southport, Lancashire, the actress made her stage debut aged 12 before working with Ensa, the armed forces' entertainment body, during World War II. After moving to London, she was encouraged to change her surname by Noel Coward while appearing in a production of his play Private Lives. The actress chose Bryant as her new stage name, after the match manufacturers Bryant and May, but became Dora Bryan when a theatre programme omitted the last letter. She went on to play the title role in Hello, Dolly on stage and make appearances in such films as The Blue Lamp, Carry On Sergeant and The Great St Trinian's Train Robbery. She was also heard on radio in Hancock's Half Hour and alongside Nicholas Parsons and Kenneth Horne in the comedy series Much Binding in the Marsh. Bryan, who became an OBE in 1996, headlined a number of stage revues and made several appearances at the National Theatre. She had a recurring role in Absolutely Fabulous as June Whitfield's on-screen friend Dolly and was seen as Ros Utterthwaite in Last of the Summer Wine. In real life she endured several hardships. She suffered two nervous breakdowns, her adopted daughter Georgina died from alcoholism and her husband, cricketer Bill Lawton, died from Alzheimer's in 2008. She was also afflicted by short-term memory loss that affected her ability to learn lines and led to her retirement in 2006. Lionel Blair was among those paying tribute to the actress on Twitter. "So very sad to hear of the passing of my good friend Dora Bryan," he wrote. "She was wonderful." There seemed to be almost an unwritten rule that in the 1950s that a British film had to feature Dora somewhere. The young Dora Broadbent was, by her own admission, a show-off. She would perform at a bus stop if she could. She certainly had a natural comic talent - but too often it was in bit parts. Her CV was littered with scene-stealing cameos often as a barmaid or a shop assistant or (more than once) a prostitute. If you wanted a bit of chirpy charm you sent for Dora. There were more than 60 films ranging from The Cure for Love with Robert Donat to Mother Riley Meets The Vampire. Thankfully, she was allowed to be centre stage on the West End. Nothing, she said, topped the feeling of standing on the top of a sweeping staircase with all eyes on her and the band striking up for the opening of her favourite show, Hello Dolly.